Make Times Tables Fun with HoliMaths Multiplication Game for Kids! - Look! We're Learning! Make Times Tables Fun with HoliMaths Multiplication Game for Kids! 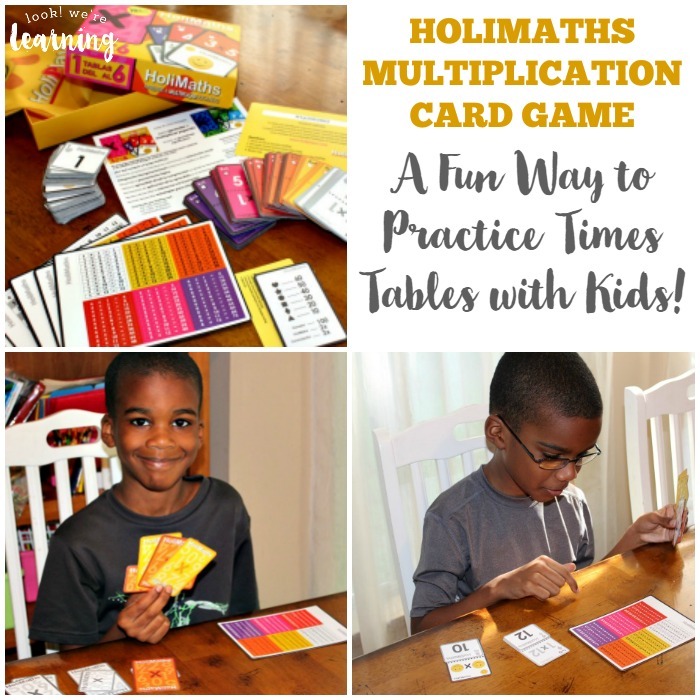 Thanks to HoliMaths, a brand new multiplication game for kids, practicing times tables can be actual, honest-to-goodness fun! Plus, several of my kids could play it together! 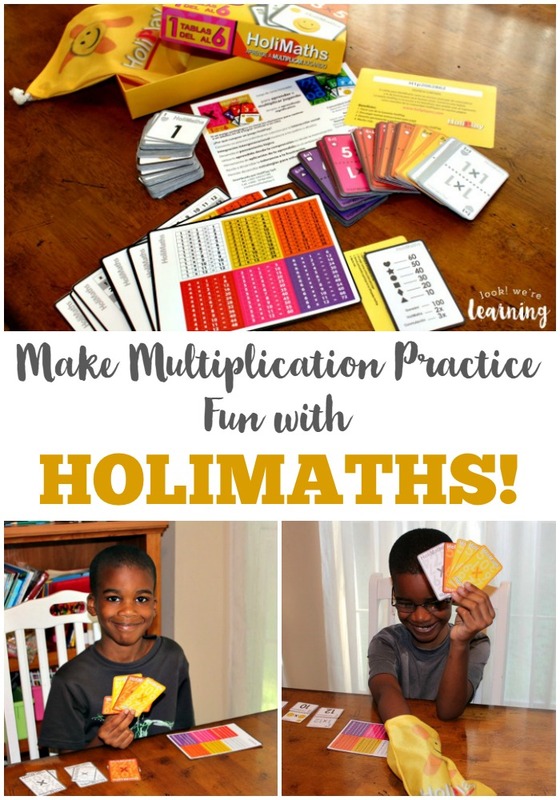 Read on to see how practicing multiplication is a snap with HoliMaths! What is HoliMaths Multiplication Game for Kids? 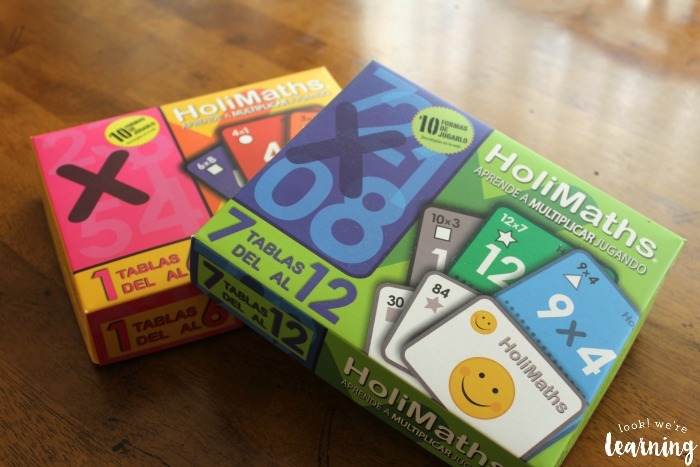 HoliMaths is a fun and flexible multiplication card game that kids can play with or without adult supervision. There are ten, yes, ten different ways to play with these cards, so you’re almost guaranteed that your kids will never get bored. HoliMaths comes in two levels: One game featuring times tables from 1 to 6 and a second featuring times tables from 7 to 12. Each game can be played by up to six players, so if you have both games, you could have up to 12 people playing the game at any time. And, yes, the boxes are in Spanish. More on that in a bit. 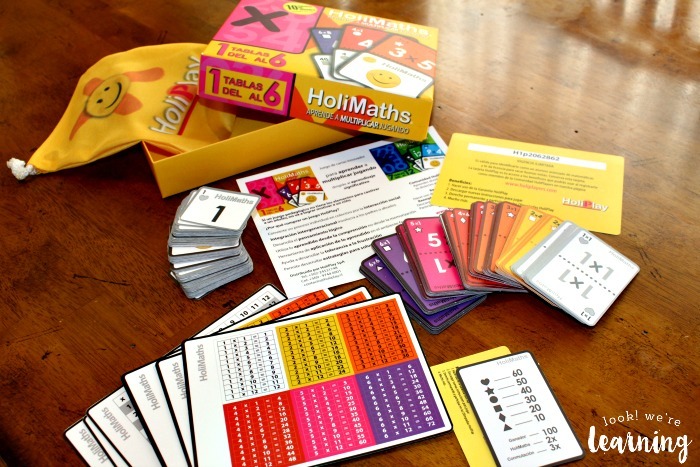 Here’s what’s inside the HoliMaths game box. It’s a lot, right? 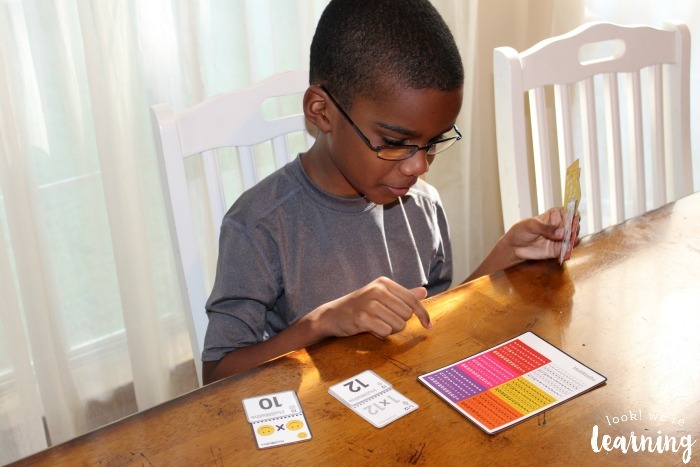 The game includes multiplication table charts – one for each player. There are also multiplication problem cards. In this set, there are times tables from 1 to 6, so each set is color coded. The ones tables cards are all grey, the twos tables cards are all yellow, and so on. The card at the bottom of the image with the symbols is the scoring system. 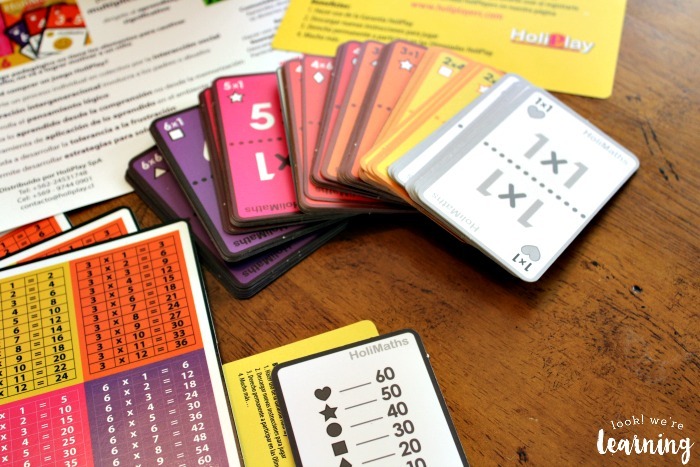 Since each card is coded with a symbol, you can look at the point (puntaje) card to see how to count each correct pair. The player with the most points at the end wins! Finally, there are many small solution cards. These are pretty important, as you’ll see next. So how do you play HoliMaths? As I mentioned earlier, there are ten different game play options. 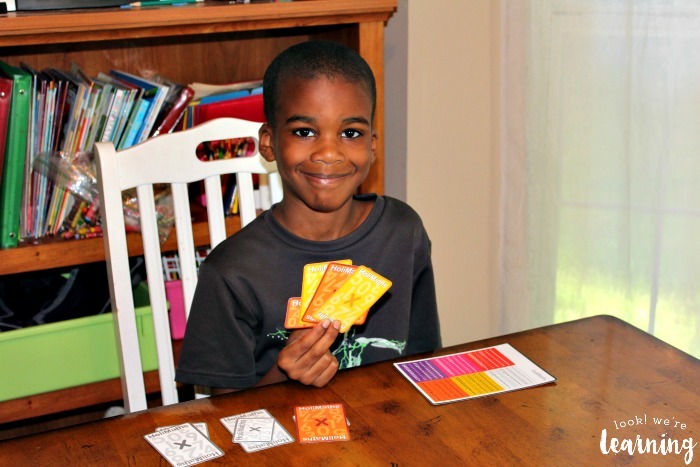 Since our game included kids of several grade levels, I started with the Classic Play method (Method #1). 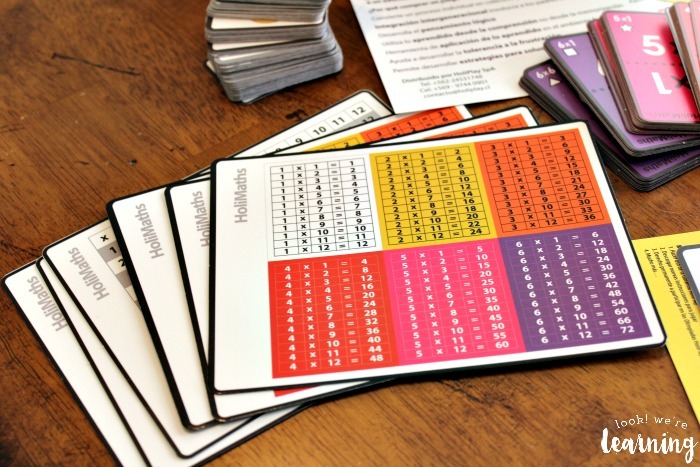 For a look at how to play each version of HoliMaths, see the How to Play section on the HoliMaths website. As I also mentioned earlier, most of the documentation in the game box is in Spanish. That’s because the game was originally designed for a Spanish-speaking audience. 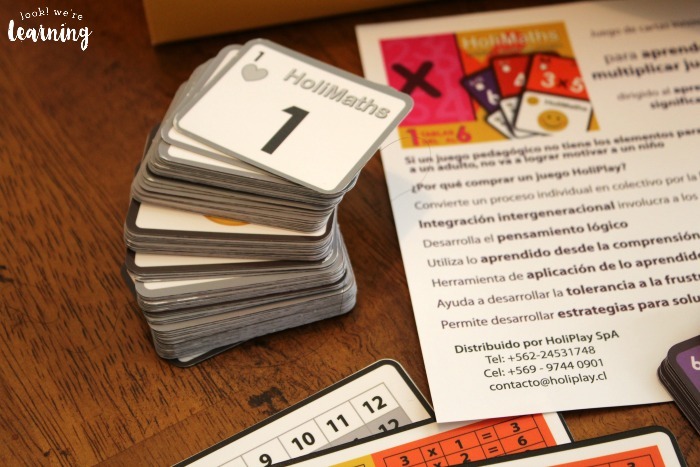 But you don’t have to be bilingual to play HoliMaths! There’s an English-language version of the website, complete with video instructions in English! We chose three times tables to work with, since we had three players. Because my boys are in 2nd and 3rd grade, respectively, we used the ones, twos, and threes tables to play with. My sons haven’t memorized their multiplication tables yet, so we handed out a times tables chart for each player as we dealt out the cards. That way, they could find the solutions to the problems on their cards easily – without getting frustrated. The idea is to make a match of a problem card with the correct solution card. My third grader, for example, had the problem card 1 x 12. When he looked at the correct color-coded table on the chart, he saw that 1 x 12 = 12. So he had to match that problem with a solution card featuring the number 12. As you might have noticed, some of the cards have smiley faces on them. These are “wild” cards – they can be used to represent any problem or solution you need to make a match. First, you clear all of the matches out of your hand as soon as the cards are dealt. Then, you tackle the remaining cards in the game. 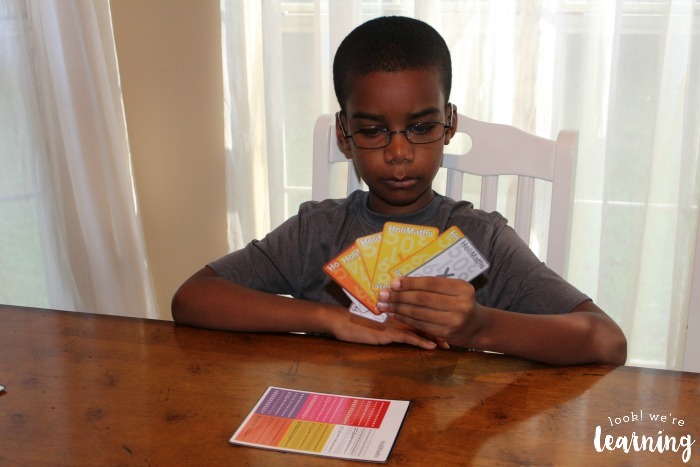 As the kids removed the matching problems and solutions from their hands, they became much more comfortable with using the game cards. One of the suggestions in the “How to Play” section that I love was to have the kids call out the problem and solution once they matched them up. That way, you can see if they’re answering each problem correctly. It’s silly, but it works! They were reciting multiplication facts left and right! If you can’t find a match for your problem cards or solution cards, you draw another problem card from a pile on the table and you draw a solution card from the game bag. 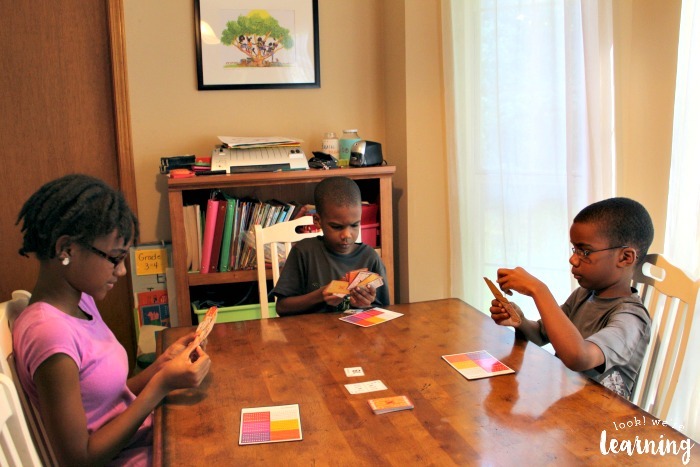 As the game continues, each player empties their hand and then counts up their score. At the end of our game, our youngest player actually had the highest score! He was pretty excited about his success. 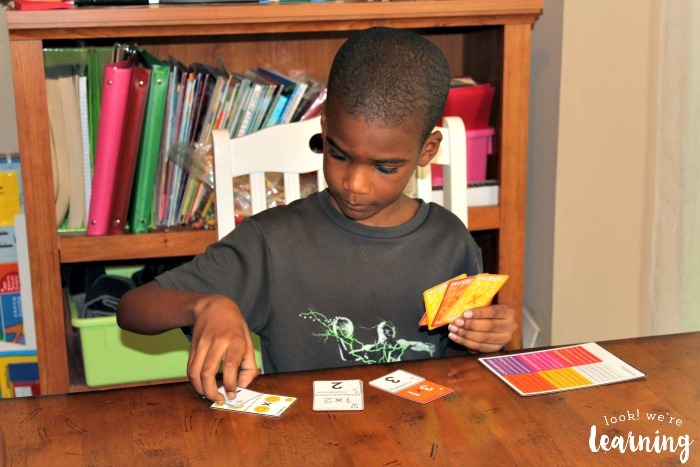 We really loved playing this fun multiplication game for kids! I can’t wait to “plan” a morning of multiplication practice with my boys by just having them play HoliMaths for an hour or so. They’ll be thrilled! 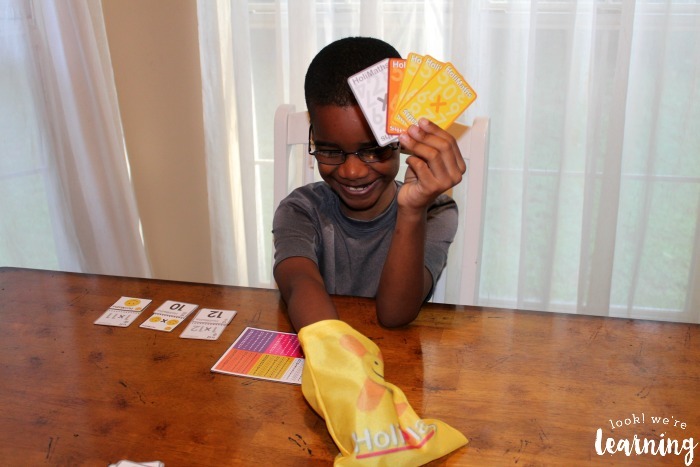 Be sure to visit HoliMaths to learn more about this game, all the ways you can play it with your kids, and how to get it for yourself! And don’t forget to follow HoliMaths on social media for product news! Get more ideas on how to make math fun from my Math Mania board on Pinterest! Thanks Selena so much for a great review ! 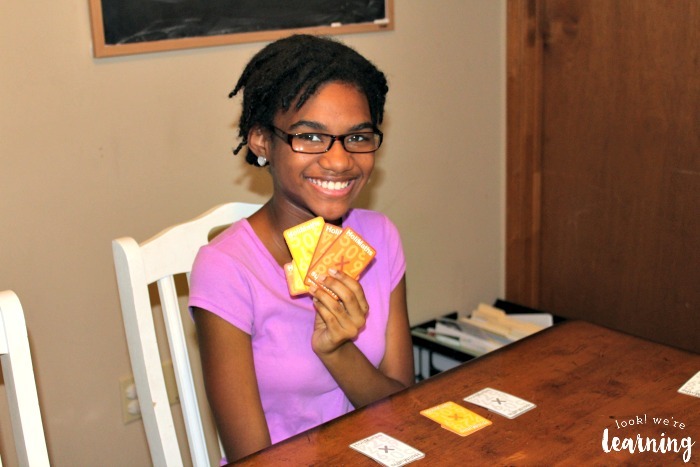 Support us promoting on Thunderclap and help us spread the word out of a great educational game – a must have tool in your Homeschool!